To NGK's Shareholders | Investor Relations | NGK INSULATORS, LTD.
May 2019 will mark the 100th anniversary of NGK's founding. Beginning with insulator manufacturing, we have steadily expanded our specialist fields to include automotive components, electronics, semiconductor manufacturing equipment, and others. All the while, we have maintained a single-minded commitment to continually develop and perfect diverse ceramics technologies. Thus, the history of NGK is also a history of technology. To meet growing needs and to cultivate new business opportunities, we are undertaking the largest investments made since NGK was founded. For fiscal 2018--our 99th year as a company--the shared goal of everyone in NGK is to do what we must do to deliver an expanded range of products that take advantage of our unique technologies to even more people and to achieve even greater growth. Since its founding, NGK has consistently focused on cultivating ceramics technology--particularly, material technology. As our most important strength, material technology involves the precise control of crystal sizes, shapes, and other characteristics. The growth of our company has always been driven by the immense legacy of technological knowledge and expertise that we have accumulated over our many years of operation. In addition, we need to develop our unique production technologies to make full use of these technologies. It is by using these technologies together hand in glove that we have produced all of current NGK's core products. What sets NGK apart is our capacity to come up with products made by hand, develop optimized techniques for commercially mass-producing them, and then refine these to a point beyond the ability of other companies to imitate. This is the strength that we have been cultivating and that has become our wellspring of growth. We are also known for our tenacity and perseverance when it comes to technological development. The demand for NOx sensors first took off in 2010, when new U.S. regulations came into full effect. However, by that point, NGK had already been at work for more than 15 years developing these sensors. We also spent over 10 years developing our gallium nitride wafers, which are used to produce laser light and which are installed in projectors and other equipment. Just because we create a technology doesn't mean there's an immediate demand for it. And, we, as a company, need to make a profit. It is difficult to manage, but NGK has a mission to devote time and patient effort to cultivating technologies that society will truly need at some point in the future. We use new technology to grow our profits, which we then invest in the development of new products. We used our profits from insulators to develop automotive- related products. Now, our automotive-related profits have become a foundation for growing our semiconductor-related products. Maintaining this cycle is absolutely crucial to keeping the company on a growth track. Thus, we created the company-wide "2017 Challenge 30" initiative, which sets a five-year goal of increasing the share of new products to 30% of total sales by fiscal 2017. We achieved our target percentage in fiscal 2017 and are now working to maintain it with the "Keep up 30" initiative. As sales revenues grow, it becomes harder to maintain this percentage. There may be some products the market will not be receptive to; nevertheless, our commitment to new product development remains undaunted. 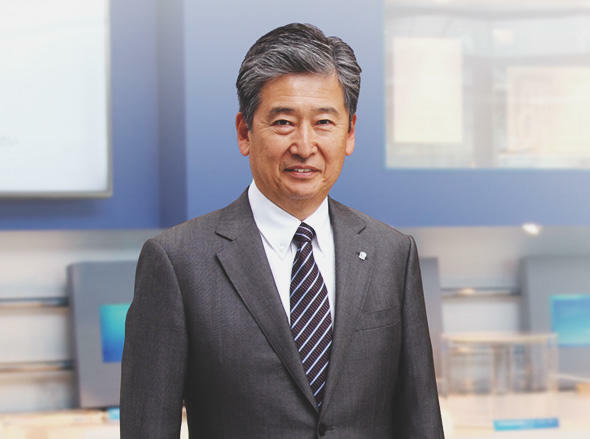 NGK is currently undertaking a three-year, over-300-billion-yen investment plan, which began in the previous fiscal year to connect the company's technological strengths with growth. Nearly half of this investment is for automotive- related products, and we build new plants in Japan and overseas, and extend facilities at existing ones. Approximately 50 billion yen is for semiconductor manufacturing equipment-related products. The remainder is being invested in the development of new products, such as ceramic batteries, and the expansion of existing production lines for new products. In Europe, NGK Ceramics Polska has begun expanding its production facilities and equipment, and is already boosting its production capacity, while NGK Ceramics Suzhou in China is scheduled to bring its No. 2 Plant on line in December 2019. In Thailand, NGK Ceramics (Thailand) began operations at its new plant this spring. This automotive-related plant produces, among other products, ceramics for purifying automobile exhaust. In Japan, we are investing in NOx sensor production at the NGK Ceramic Device Ishikawa Plant in Nomi, Ishikawa Prefecture with the aim of starting expanded production in January 2019. Additionally, as we are currently under-supply capability to respond to rapidly growing demands for semiconductor manufacturing equipment-related products, we are working to increase our production capacity by accelerating construction of a new production site in Tajimi, Gifu Prefecture as well as undertaking capital investment in our existing Komaki and Chita sites. In the area of new product development, NGK is creating product applications to commercialize three types of ceramic batteries. One is a chip-type ceramic secondary battery. It is as small as a postage stamp and has an ultra-thin, 0.4 mm body, while the incorporation of our unique crystalline orientation technology achieves high energy density. Anticipated applications for this battery include ultra-compact wireless IoT modules equipped with sensors, and next-generation credit cards with highly secure fingerprint authentication. We are also developing a zinc secondary battery. Although zinc itself is widely used for the electrodes in primary batteries, its propensity to cause short-circuiting when repeatedly charged has prevented it from being used in (rechargeable) secondary batteries. At NGK, we have successfully realized a zinc secondary battery through the development of our proprietary hydroxide ion-conducting ceramics. Besides offering a large capacity, this battery, uses an aqueous electrolyte unlike lithium-ion types of batteries, and thus offers a high level of safety, which makes it suitable for indoor applications. Third one is a solid oxide fuel cell (SOFC) module, which uses hydrogen from city gas to generate power. Our unique, all-ceramic design makes the battery durable while still allowing for high generating efficiency. Additionally, the development planning we have undertaken as part of our Optical Component Project has resulted in two new products that we released in fiscal 2017. One is a gallium nitride wafer, which can replace conventional mercury lamps in the design of base substrates to make projector light sources with an unprecedented, ultra-high brightness. The other is a micro-lens for UV LED lights, which can be used to improve the sterilization efficiency of UV LED lights by narrowing their irradiation area. Now that the demand for automotive-related products and semiconductor manufacturing equipment-related products is exploding, NGK is undertaking the largest level of capital investments in its history. On top of this, technology developments such as AI and autonomous vehicles continue to create entirely new areas of business. NGK is in an unprecedented period of growth, and therefore we need to be improving productivity and expanding production in our existing businesses to generate solid profits that can then be applied to new product development. We need to remain alert and attentive to growing trends and the emerging needs of changing times for sowing seeds for business. In the case of new business areas, as mentioned earlier, one area we are focusing on is base substrates for control circuit formation in IT. Our research and development in this area is quite active, and we are also evaluating a variety of ideas related to ceramics. In 2017, the EU and China announced a policy change aimed at promoting the widespread adoption of electric vehicles (EV), but at NGK we are anticipating that the demand for gasoline and diesel-powered vehicles will be still increasing up through the mid-2020s, creating a bigger demand, which our supply capacity will need to expand in order to meet. Even if you just look into battery issues, it is figured out that EVs have a number of hurdles to overcome before widespread adoption can be achieved. The lithium-ion secondary batteries currently used for EVs are not sufficiently durable and have issues in raw material procurement. Also, although a number of companies are trying to develop an all-solid-state battery, which would be superior in terms of safety and performance, there would still be a variety of challenges left, such as improving thermal durability. Because it takes time to go from the development phase to the evaluation phase, even if the all-solid state type of battery is developed by 2020, achieving practical application would take until at least the mid-2020s. This is why we believe that the demand for gasoline and diesel vehicles will continue to grow up through the mid-2020s. In fact, because of this likely continued growth in demand, it makes research into cleaner exhaust technologies all that much more essential. Towards this end, we are currently working on improving vehicle cold starts, which involves a large amount of exhaust material being expelled when the engine is turned on. If the catalyst in the vehicle is preheated electrically before the engine starts, this will reduce the amount of exhaust material expelled during a cold start. This is the sort of area into which we can expand our business and find a good deal of room for growth. What needs to be done is clear.The question is how we accomplish. We are in a period of rapid growth without precedent, and there are still so many factors and opportunities which the NGK Group can capitalize upon for even greater growth. We must not squander these opportunities; rather, our mastery of them will determine the course of NGK's next 100 years. I tell everyone in NGK that the key word for this year is "completion." By that, I mean we must be thorough in completing our preparations this year for the coming centenary. We will carry through capital investments. We will meet the needs of the market. Although it will be challenging, what needs to be done is clear. My hope is that this spirit of "completion" will drive us to tackle each of the challenges facing NGK and help us cultivate a foundation for sustainable growth that will take us through the next 100 years.